secondly, to ensure that they are done in a way which directs the flow of prana (life force, or energy) appropriately within the body. Different postures affect the flow of prana in different ways, each yoga practitioner has his or her own individual body, and each asana has its own detailed alignment principles, but awareness of the following ten points should inform the practice of all asanas and help most students avoid injury. 1. Stability and lightness: all yoga postures should be practised in a way which seeks to balance stability or steadiness (sthira) with lightness or ease (sukha). Try to maintain a sense of both yielding to the floor and rebounding away from it. Think of generating all movement, however subtle, from the core of your body in your abdomen and try to maintain a gentle engagement of your lower abdomen throughout your asana practice. 2. Start with the foundation: whether that is your feet (in standing postures), your sitting bones (in seated postures), your hands (in hand balances), or whatever it may be, it is essential to pay attention to establishing a secure foundation from which your asana can grow. Then you can look to the detail of the particular asana. 3. Balance your feet: in standing postures, check how your weight is distributed across your feet. Is it more on one foot than the other? 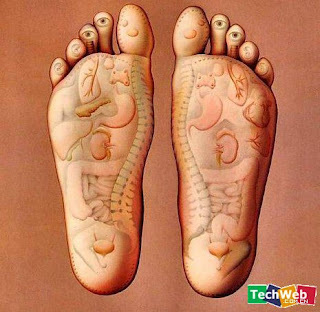 Or more on the outer edges of the feet than the inner? Or more to the heels than the balls of the feet? Our feet have three main weight bearing points: the ball of the big toe, the ball of the little toe and the heel. Try to distribute your weight evenly across all three points and (in most standing postures) evenly between both feet. 4. Toes in or out? In general, when standing in a symmetrical posture, and when you are sitting with one or more legs extended out, ensure that your feet (unless you are asked to bring them together) are parallel to each other and to the edges of your mat. For many of us who habitually turn our toes out when standing, this in practice means focussing on turning the toes inwards slightly. Aligning the feet in this way both ensure that our knees are in the same alignment as our feet (and not twisting) and protects our lower back. The latter is particularly important when bending forwards or backwards. 5. What happens to my knees? The knee joint has limited rotational movement, and, especially when standing or lunging, it is important that the knee points in the same direction as the foot of the same leg, and does not twist inwards or (though less likely) outwards. In postures such as uttanasana (standing forward bend) and adho mukha svanasana (downward facing dog), this is generally achieved by keeping your feet about as wide apart as your hips. It is also important in asymmetrical standing postures (e.g. the warrior postures) to ensure that the knee does not move forward of the line of the heel (the exception to this is lunging with the back knee on the floor). Finally, the knee should not lock, or hyper-extend. Always maintain a “micro-bend” by only ever straightening the leg to about 90% of its capacity to straighten. This can be achieved by engaging the thigh muscles, rather than simply pulling the kneecap back, and will avoid straining the hamstrings. 6. And thighs? In general, when bending forwards or backwards (whether standing, sitting, lying or inverted) maintain a slight, but noticeable, inward rotation of your thighs (but not so much that it distorts your knee alignment by making you knock-kneed). This will allow the sacro-iliac joints in the lower back to open and avoid the compression in these joints which is the source of much lower back pain. 7. Is my spine meant to be straight? No, our spine has three natural curves – the lower back (lumbar spine) and neck area (cervical spine) curve into the body; the middle back (thoracic spine) curves outwards. Because of the structure of the vertebrae, disks and joints of the spine, the higher up the spine you go, the more rotational movement the spine has. For this reason, twisting postures should focus on rotation in the middle and upper back, not the lower (lumbar) spine. 8. How do I twist? By initiating the twist from the core of the body in the abdominal area: in twisting postures, think of turning the navel first, then the chest, then the shoulders, and finally the head and neck. Try not to lead with your head in an effort to appear deeper in the posture: rather, allow the twist to grow organically. Imagine each inhale lengthening your spine (both upwards and downwards) and creating more space between your vertebrae, and each exhale deepening the rotation. (c) try not to clench your buttocks: they should be lightly engaged, but not clenched: this too will inhibit the spine’s ability to move. 10. A different perspective In inverted postures such as shoulderstand, headstand and handstand, two of the most important parts of your body are your legs. Engaging your abdominal and leg muscles in order to keep a sense of upward movement of the legs is essential both for general stability in the posture and to avoid the weight of the legs sinking into the lower back. In inversions, try to reach for the ceiling with both the ball of your foot and your heel at the same time.